Article based on information covered in StartingAClothingLine.com’s #1 How To Fashion Book – The Official Step by Step Guide to Starting a Clothing Line. Many people have always asked my partner and I, “How to start my own clothing line?” There really wasn’t just a simple answer that we could just reply with. Despite what some of the things that have been written all over the web, how to start a clothing line from scratch represents a special business model. Sure the normal business model of registering your business as a D.B.A. or LLC, opening a business bank account etc. apply but there is so much more to the formula if you want to be successful. In this in-depth article, I will go over the 6 most important points on how to effectively start your own clothing line. This article will give you advise and tips on how to start a clothing line plus guide you to resources that will walk you through every step of the fashion design process with valuable industry insight and the tools to make your line a reality. Our site is all about providing genuine solutions that will help ordinary people and aspiring fashion designers start their own line fashion labels successfully. We don’t just talk the talk – our resources put you in position to run! Since 2004, we have been helping aspiring designers just like you start and design their own clothing line. The Fashion Mogul Package Clothing Line Start-Up Kit will help you with everything you need to start out with your own line, design it and get it made even if you have no prior experience. The Fashion Mogul Kit helps aspiring fashion designers and beginners turn their fashion ideas into professional clothing lines with confidence. It is definitely worth checking out.. When your starting a new clothing line, the name of your line is everything. Choose a name that best represents you now and where you would like to go in the future with your clothing line. The next thing you should do is lock down your domain name. This is a great step because it not only gets your domain name before someone else does but it can be a source of inspiration. Getting your domain name will get you excited and it will make you work harder to move forward. Domain registration can run anywhere from $8 to $15 per year. Godaddy.com is a good source for domain name registration. But wait! Sure it is wonderful that your clothing line’s domain name is available but before you register it – look at step 2. However, if you know your name is unique – you can still go ahead and obtain your domain name now just to get it out the way. This is also a simple way to decide if the name you can up with is usable. If you see someone else already has the domain name and their doing fashion too then you know you have to pick a new name. Note: once you get going good and you are solid, you will want to update the amount of years you registered your domain more. Do this by registering your domain for a long period of time at once to make your domain look more stable. Example – say you did a two year term to start it, you may want to do a 5 year term next. This will also increase the domain authority / ranking of your site over the long run because you are basically telling the world / search engines / that you are serious about your fashion business. There is SEO benefit from doing so which means this could help your clothing line website receive more traffic. New Fashion Designer / Clothing Line Start-Up Checklist – 4 Must Have Items! Next think about what type of clothing do you want to make first. Do you want to start with T-shirts, jeans etc. Keep your scope limited at first until you build a name for yourself. This is important because doing a large line can be very costly when your starting a clothing line from scratch. 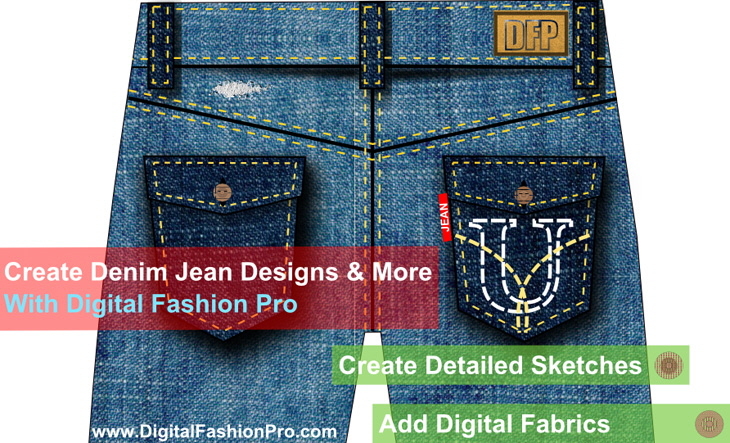 Get a fashion design program like Digital Fashion Pro to create all of your fashion design sketches and create your collection. Get all of your fashion sketches together and then figure out which ones you want to produce first. Show them to friends and family and see which ones people like the most. Next you can use your professional sketches to give to a seamstress, clothing manufacturer, or screen-printer who can make your designs for you. First create your design sketch, then a technical sketch. You can learn how to create technical sketches with our Beyond the Basics Upgrade for Digital Fashion Pro. Next you will need to create a spec sheet. You can create spec sheets with our Fashion Business Center. These items make up your style / garment tech pack. Next decide how you want to get your clothing made. Do you want to mass produce or just produce a small production run to see how things go. Find manufacturers to make your clothing line on our Ultimate Fashion Contact List of over 500 Manufacturing Contacts or look for local contractors like screen-printers to print your T-shirts. How much money does it cost to start a clothing line? The answer to this question is different for everyone. First you should make your business plan and determine how much money you need to get your line off the ground. To do this, you should find out how much a production run will cost, advertising etc. Coming up with the capital to launch your clothing line can be tricky because a clothing line is considered an intangible business by banks. Banks will only loan you money if you have collateral such as a house to put up. The Official Step by Step Guide To Starting A Clothing Line Book offers creative ways to finance your clothing line plus a better understanding of exactly what it will cost you to get started. It is the number one book in the world to related to the real facts of the reality of starting your own clothing line with truly detailed steps and information. Also check out The Secret to Raising Money to Start a Clothing Line. Another Great Tool for finding out how much it will cost you to start your line is The Fashion Business Center. Also this tool will help you figure out how many pieces to include in your clothing collection based on budgeting. Now whether you buy the items we recommend here or other items this is what you should remember. If you can’t afford something – you should figure your how you can afford it. Web articles are great but they will only take you so far. Investing in proven things that have worked for others will take you a long way. One of our clients told us that, he wished he had just bought our course because it would have saved him $4800 that was wasted on a botched production run. So maybe you don’t have the funds for our highly recommended course or package at the moment but having a clothing business is all about selling. Therefore, you have to sell the idea of your clothing line to family, friends, co-workers etc. to raise money even if it is to buy resources. If each of them were to give you a little something towards buying the resources that will help you out you would be well on your way. Later they may even become larger investors in your line. After all, if you can’t sell the people close to you on your idea – who can you sell to? Believe in yourself and your vision and others will help you if you ask. The biggest myth about starting a line is thinking someone or some company is going to take all the risk of getting your clothing made while you bring nothing to the table but an idea and then they are to get paid once you sell something. In this day and age that is pretty much a pipe dream. There are always a couple exceptions to the rule but they are few and far between. Think about it, if you aren’t willing to invest in yourself, why should anyone else? This is why the Official Step by Step Guide to Starting a Clothing Line Book is so important because it shows you how to get your clothing line started even on a small budget. 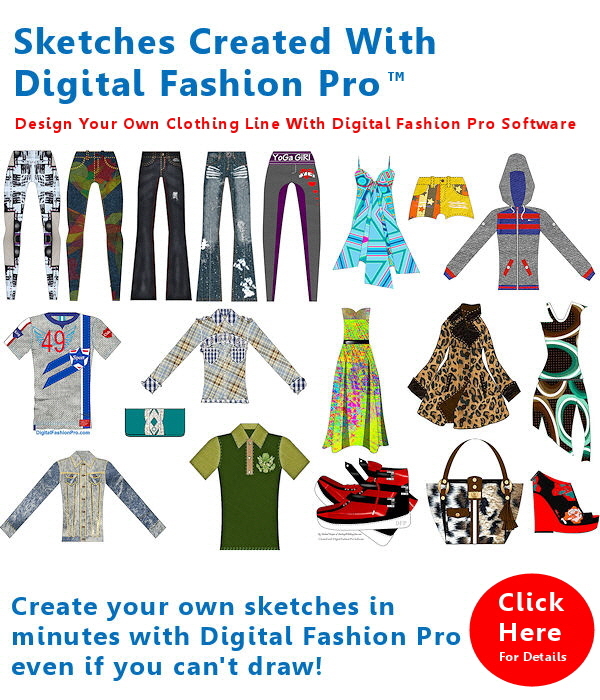 If you are starting a clothing line and need investors – the very least you can do is know exactly how the fashion business works and how to be able to show prospective investors your professional fashion sketches and designs. So back to the next step in your line. Now that your clothing is being made it very important that your contractor / manufacturer delivers quality goods to you and on time. Your reputation is on the line and your retail clients will want to know you can deliver when you say you are and that your clothing is of good quality. If your clothing is not of high quality, your retail clients will return it to you. As a clothing line owner, you have to think about new ways to brand your line everyday. It is important that you give consumers and store owners a reason why they should choose to support your line. Make sure you stand out. Being different and unique is a good thing in the fashion industry. You also want to think strongly about how to define your apparel line. Now that you have goods on the way. Begin taking orders for these items if you haven’t already. When my partner and I started our line, we would go to summer festivals, church festivals etc. and rent booths to sell our line. One summer we made over $15,000 selling T-shirts. T-shirts are actually an excellent way to market your line. Sell your items to any and everyone you know. People will see them wearing it and ask how they can order. Make sure you offer deals if people buy more than one. This is called building a local selling network. Once you have a network that loves your clothes you can always sell them your new releases. Make sure you maintain a contact list of all of your customers. This is good for cash flow. Where can I sell my clothing? First think about putting your line in local stores. Make appointments with them to go in and show the buyer your line. After getting your line in stores locally and learning how things work you can then move on to thinking about national distribution. How to Market a Clothing Line – See the Official Step by Step Guide for that as well. Marketing is an essential step in the success of your clothing line. People must know you exist. Make sure you have a professional looking website first and foremost. Make sure you put out a press release about your line. You can also advertise your line online and in magazines etc. One thing you must have is postcards. Make sure you blanket your city with postcards that advertise your clothing line. Important: Make sure your postcards have your Facebook page, Pinterest Page, Twitter Page, Instagram and certainly your website. I got ahead of myself. Make sure you have set up your clothing line on those sites to help market it. Also make sure you have a QR scan code on the postcard so users can scan it and go directly to your website. A good resource for free QR codes is Qrstuff.com. The important thing is to build buzz and momentum surrounding your clothing line. Contact your local radio stations and see if you can get them to interview you. You can also think about attending local and national clothing tradeshows like Magic International. Exhibiting at clothing tradeshows will put you right in front of clothing buyers if you want to distribute your line nationally. Other fashion events like New York Fashion Week are great to attend as well. Management. Manage your money, your orders, production, delivery and everything else about your line to perfection. The Fashion Business Center on our site is the perfect fashion business management tool. It helps you manage production, inventory, style production forecast and costing, retail orders, spec sheet templates, line sheet templates, order forms and more. 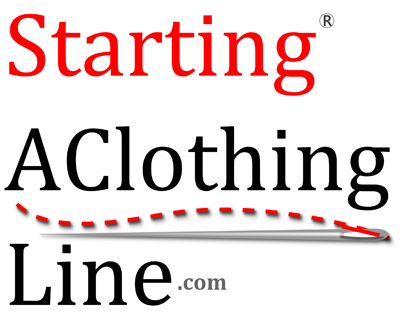 Startingaclothingline.com was created to help fashion entrepreneurs develop solid strategies to advance their fashion lines and ideas with an emphasis on management. See All of what we have here. The thing about starting a clothing line is that you must have the passion for it. Sleep, eat and breathe it. Nothing feels better than seeing others wearing your creations. Making money off those creations feels even better. Make sure you have adequate price points on your merchandise that will allow you to make money via wholesale and selling directly to the consumer. 1. Coming Up With a Great Name for Your Clothing Line – Very Important! Make Sure It is Catchy. About the Publisher: Startingaclothingline.com is a company specializing in resources that help ordinary people start their own fashion lines successfully. About the Author: Michael Harper Co-Founder of StartingAClothingLine.com and Co-Author of the Official Step by Step Guide to Starting A Clothing Line. Let our StartingAClothingLine.com Resources help you start and run your own line successfully and efficiently.